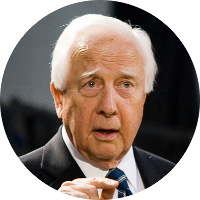 David McCullough is a 2-time Pulitzer Prize winning author and historian. He has also narrated television shows including PBS’s American Experience, and a number of documentaries produced by Ken Burns. David McCullough’s Pulitzer Prize winning books were Truman and John Adams. HBO adapted the former into a television movie and the latter into a miniseries. As a Presidential historian, it seems only fitting that David McCullough would have a few U.S. Presidents in his family tree. These include Millard Fillmore, Ulysses S. Grant, Grover Cleveland, and Gerald Ford. He also has a kinship to the current royal family through a connection with the late Princess Diana. David McCullough’s famous historical kin include abolitionist John Brown, Declaration of Independence signer William Williams, Wells Fargo’s Henry Wells, poet Emily Dickinson, Admiral George Dewey, artist Norman Rockwell, and many others. Some of his celebrity kin include Zac Efron, Richard Gere, David Hyde Pierce, James Spader, Jodie Foster, Sigourney Weaver, Ellen DeGeneres, Shirley Temple, and Donnie & Marie Osmond.